I’m going to be off the grid for the next two days, participating in my first multiple-day sit or sesshin. Things kick off at Black Mountain Center at noon tomorrow, with half a day of meditation on Friday, a full day on Saturday, again Sunday morning, and then a concluding shuso ceremony back at Russian River Zendo for Cynthia Kear. Thus far, I have participated in four one-day sits. They are extremely challenging for me. I have a very hard time leaving the form world of clocks and to-do lists, and moving into the emptiness realm, where my only job is to respond to the bell, sitting, walking kinhin, or leaving the zendo for a meal. I have a tendency to try to memorize the schedule ahead of time, and count the number of zazen periods. Then I tick them off in my mind as I successfully complete each one. But a one-day sit at Russian River Zendo is only from 9 a.m. to 5 p.m., with about seven or so periods of zazen. That’s pretty easy to keep track of. This weekend, our long day will be from 6 a.m. to 9 p.m., with, if I have counted correctly, 14 periods of zazen. There’s no way I’ll be able to keep track. I have heard that this is why multiple-day sits are so powerful – one is forced to give up, let go, and simply sit. I am trying not to fret about how physically difficult it will be. I am also trying not to stew about how I am going to occupy myself mentally. In fact, my coping strategy up to this moment has been to not think about the sesshin at all, figuring that the only thing I’d do anyway is worry, so why bother? I had to laugh about the initial question. I can just imagine that scenario. I’ll bring a good novel, and sit on my cushion all day flipping pages. While I’m at it, I might as well pack my iPod, so I can have some tunes! Another challenge for me in the next three days is that Black Mountain Center doesn’t allow smoking on the grounds, at all – and the grounds are huge, so I don’t think there’s any hope of walking out to the end of the driveway. I smoke a pack a day, which works out to roughly one cigarette every hour. Three days without a smoke is definitely going to stir up some usually-camouflaged emotion….I have purchased Nicorette lozenges as a discrete emergency measure. So, wish me luck! On the sitting, the counting, and the nonsmoking marathon. Should be one interesting weekend! RRZ closed due to off-site sesshin. Healdsburg sangha will not meet on Nov. 24 (due to Thanksgiving) and Dec. 29 (the week between Christmas and New Year’s). On Dec. 22, a special Bodhisattva Ceremony will be held. Today marks a historic victory for those in the LGBT community. President Barack Obama signed into law the Matthew Shepard and James Byrd Hate Crimes Prevention Act. This law officially adds violence directed at a person because of their sexual orientation or gender identity to the reasons that someone can be tried for a hate crime. This is very personal for me. I was living in San Francisco when Matthew Shepard was tortured and left to die tied to a fence in Wyoming in 1998. The next day, the huge rainbow flag in the Castro was lowered to half mast, and our entire community was in shock. We were also frightened, looking over our shoulders liked hunted animals. It brought home how incredibly vulnerable we could be in a society that routinely classified us as sinners and second-class citizens. That next summer, I was in Los Angeles with my girlfriend, when we were threatened and chased down the street by three angry young men dressed in “skinhead” garb. We managed to escape to a coffee shop. Moments later, the men showed up again, and saw us through the plate glass window. They began throwing their bodies up against the glass, screaming obscenities at us. There were only two young people in the coffee shop besides us. With shaking hands, I grabbed the pay phone on the wall and dialed 911. When I asked for help, the dispatcher calmly said, “In what way do you feel threatened?” The police never came. We were left to figure out a safe exit on our own, with the assistance of other patrons. For ten years, Matthew’s parents, LGBT activists and sympathetic politicians have lobbied to add sexual orientation and gender identity to the list of motivations on the hate crimes act. Numerous times it was brought forward; numerous times it failed, turned down by people like former President George W. Bush, who said that gay people shouldn’t be given “special treatment.” Each time it came up, I believed it would finally pass. Again and again, I was disappointed. And each disappointment made me feel less safe in this country, in this community. 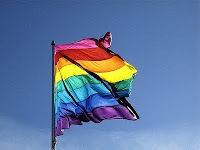 So it is with great exultation and relief that I received the flurry of e-mails in my inbox today from the various groups I subscribe to which deal with gay and lesbian issues. Finally, there is recognition from my government that LGBT people are singled out by perpetrators. Finally, there is some legislation with some teeth in it to send a societal message that this behavior will not be tolerated. And finally, most important of all, Matthew Shepard can rest in peace. We have, at last, provided him with a meaningful legacy. What better message of compassion? One of my favorite anecdotes is about the drunk driver careening down the highway with his name spelled out on his plates – which led to his arrest, since every driver on the road with a cell phone was able to quickly identify him to police. Personally, I’ve never felt so strongly connected to my vehicle that I wanted to purchase vanity plates to declare my personality to the world. Not because I want to be able to pursue a criminal career without fear of getting caught…but simply because I’ve never cared enough to invest the time, energy and money in choosing and purchasing special license plates. At the same time, though, I have been sucked into the whole “car as identity crisis” inadvertently. Standard issue California license plates have a single number, three letters, then three numbers. So the three letters, even on a normal plate, can sometimes spell a word, or hint at one in that special “license plate jargon.” A good friend had the letters “XTC” on her state-issued plate – “ecstasy.” Cool! Unfortunately, at the same time, my middle three letters were “TDM” – and the only thing I could come up with from those letters was the word “tedium.” Hardly inspiring to have a synonym for “boredom” as your automotive/highway identity. I suffered stubbornly for nine years with that plate, refusing to succumb to the materialism and egocentrism of purchasing a new plate simply to escape “tedium.” But when I bought a new car three years ago, I was almost as excited at the prospect of new plates (and the possibility of a new moniker!) as I was about having a 2006 model. So I cannot tell you with what dismay I opened the package containing my new license plates, finding that the state had issued me the letters “TED.” Oh, no! “Tedium” again! Once is an accident, a fluke; twice? It had to be a sign from the universe – and not a sign I wanted to see. But a moment of internet grace has saved me. While surfing the web, I ran across the website at http://www.ted.com/. TED stands for “technology, entertainment and design” and the site’s tagline is “ideas worth spreading.” It is a fabulous collection of online lectures by authors, scientists, inventors, designers, spiritual leaders, all kinds of fascinating people, sharing their expertise and enthusiasm on a wide-ranging field of enthralling topics. So finally, I can rest happily with my “TDM/TED” license plate identity. I’ll just pretend that I knew all along that it brought me into the good company of intellectuals and artists, dreamers and doers. What does your license plate say? Has anybody lucked out by being issued “ZEN”? In our study group discussion on Saturday, reviewing the next passage from Kosho Uchiyama’s Opening the Hand of Thought: Foundations of Zen Buddhist Practice, we were focusing on the idea of letting go of thoughts while practicing zazen. Uchiyama differentiates between ideas or thoughts merely occurring and chasing after thoughts and thinking. He says that of course, since we are not rocks, we will have thoughts while we are sitting meditation. But the thoughts should just arise and then be let go. What is to be avoided is having a thought, grabbing on, and then running with it. Everyone in the study group had had clear experiences of that grasping behavior, when, for instance, you figure out your budget while sitting zazen, or plan your entire day’s schedule while on the cushion, supposedly meditating. Uchiyama says, If a thought occurs during zazen and we proceed to chase after it, then we are thinking and not doing zazen. Now, that feels a little harsh. You mean that 35 minutes on the zafu doesn’t even count, if your mind is racing around? Quite a few of us in the group felt pretty discouraged upon first hearing that proclamation. Uchiyama says that the posture of zazen, the way we sit, quiets the excitability of the mind, and helps us let go of the grasping when thoughts do arise. But each of us knows that the posture alone does not accomplish that pure shikantaza (just sitting) state. Sometimes when I sit, I find myself writing an entire short story, regardless of the fact that my body is still. So that’s not zazen? Thankfully, Uchiyama continues with this helpful note: So the essential point when doing zazen is to aim, full of life, at the posture of zazen with our flesh and bones while at the same time leaving everything up to the posture and letting go of thoughts. By aiming at the zazen posture and simultaneously opening the hand of thought, both body and mind do zazen in the proper spirit. Ah, there’s the saving grace. It’s about aiming at the correct posture and aiming at releasing thoughts. It reminds me of the Buddhist precepts. They are not commandments, not Thou shalt nots. They are vows, directives, intentions. We understand that we will repeatedly violate all of them, some on a daily basis: harboring ill will, speaking badly of others, putting ourselves before others. The vow is about continuing to make that right effort, aiming towards upholding the precepts, even though we know we will break them. And so it is with zazen. It is humanly impossible to not chase after a single thought during a full zazen period. The thoughts come up, and it is our mind’s nature to chase. The goal is to gently catch ourselves in the act, again and again, and once more turn our attention back to the body, back to the breath, back to the coming and going of thoughts with no attachment. I guess that’s why this is a life practice. There are no graduates. What If a Gunman Comes into the Zendo – Can We Move? There’s an episode of CSI that has unduly influenced my “monkey mind” while sitting zazen. (I don’t watch much television. After reading this, you’ll know why.) In the episode, four monks at a monastery are shot and killed while sitting meditation. The shooter came in while they were sitting and shot each one point blank in the forehead, execution style. But what is startling is that each one of them stayed in the meditative posture, while the killing spree went on, as if waiting their turn. No one stood up, ran, struggled….they just sat there. Now, they were not Zen monks. They were not sitting zazen. For all I know, they were practicing some kind of trance meditation. But it created an image in my head, a “goal” of not moving, that overwhelmed completely even the instincts of fear and response in a crisis. So now, occasionally when I am sitting zazen at the Healdsburg Yoga Studio, and I hear people approach on the sidewalk outside, lingering at the front door…I go into morbid fantasies. What if one of them came in with a gun, and threatened us? Would we all just sit there? Would we all continue to face the wall, unmoving, because the period of zazen was not officially ended? If a gunman rushes into the room – do we need to wait for someone to ring the bell before we can respond? I struggle with a similar “is it OK to move” question when sitting at home, only based in more mundane realities. I live in a house with five cats, three dogs and a parrot. Even when I am “home alone,” as it were, I am anything but solitary. So when I sit down to meditate, there is a very real chance that something (someone) will interrupt me. I don’t want to jump up at the slightest sound, or I’d never get through a sit period. On the other hand, I don’t want to not respond if something truly attention-worthy occurs. So my sitting goes something like this: I sit down on the cushion. I am silent and relaxed for about 10 minutes. Then I hear a crash. I remain seated, and keep my ears alert. If there is silence after the crash, I think, “Well, maybe Kenji the kitten jumped on the shower curtain again and brought the rod down. Or maybe Dozer misjudged when leaping down from the kitchen counter, and knocked my book bag onto the floor.” I can keep sitting; there will be time later to put the house back in order. However, if I hear a squawling, or a moan, maybe somebody got hurt. If I hear a flap of wings, then maybe Barney the parrot has decided to make an ungainly flight off the top of his cage and is now wandering around the living room floor, eating the new baseboard or getting dangerously close to the sleeping Bailey (cat) on the dog bed. Or if I hear a whole lot of crunching, maybe Teo the ridgeback has managed once again to spin the cat box around, and is creating a catastrophic mess in the bedroom. Time to get up and move, restoring everyone to safety. I brought up this “can I move?” question at our study group today, and discovered that everyone who shares their home with animals grapples with these issues. What if the dog is barking? Is it better to ignore that and keep meditating, or to take the little guy into your lap and stroke him? What if the cat is kneading your leg, with a generous use of claws? Do you stoically resist either moving yourself or extracting talons from your thigh, or do you gently reposition your feline friend before returning to zazen? Tony and others in the group reassured me that sitting zazen, in “no thinking” mind, does not mean that we are unable to respond to a crisis, small or life-threatening. In fact, the opposite is true: that posture of alert “no thought” puts us in an ideal position to move quickly and effortlessly toward right solution. Whew. One ridiculously misplaced crisis fantasy put to rest – only one million other distracting thoughts left to deal with! I don’t know about you, but I spend an awful lot of time listening to my internal critic. She’s that nagging voice in my head that tells me, over and over, ad nauseum, that I’m not smart enough, not talented enough, not disciplined enough, not kind enough, not pretty enough – let’s face it, just plain not enough of anything. She comes to the forefront at fairly predictable times – when I’m trying something new, venturing outside of my normal sphere. Or when I’ve just given my all for something, and one person that I come into contact with looks slightly askance or raises an eyebrow, and I become convinced that they think my project, my effort, is not only less than perfect, but in fact is so flawed that I should be embarrassed that I even made the attempt. She also surfaces disguised as envy. When I read a beautifully written paragraph by someone else, or see a gorgeously hand-wrought work of art, or hear someone play a piano etude flawlessly, she takes that moment and warps it, taking me out of that wellspring of sheer appreciation and celebration of someone else’s creation, and throws me into a self-flagellating remorse about my own ineptitude and inability to measure up. I know where the voice originated – I can trace it back to unkind teachers, shaming parents, cruel girlhood friends. But those voices are not what haunt me now. I have taken the real life critics and internalized them to the point that “she,” the grand critic, is an entity all of her own, with me wherever I go, because she lives inside of my own head. She is a monster of my own making. The bad news about that is that I’m the only one who can conquer her. The good news about that is that I’m the only one who can conquer her. Both are true – it is incredibly freeing and terrifying at the same time – it’s all up to me. one cherish all living things. This stanza is not just about loving the world, although of course, that is also our directive, our vow. It is also about loving ourselves. Even as a mother at the risk of her life/Watches over and protects her only child – what if the child is myself? What if the child is the ceramic clay that I have molded into a jizo? What if the child is the words I write late at night alone in my office? So with a boundless mind should one cherish all living things/Suffusing love over the entire world. Not a limited, critical mind, but a boundless mind. Not cherish only the perfect, the unstained, but all living things. Not loving just that which is easy to love, that which is flawless, but the entire world. So let one cultivate an infinite good will toward the whole world – not just the external world, but also the internal world. Good will and love and tenderness and protection. What if I wrapped my arms around my critic, and told her that I loved her, that I would take care of her? What then? There is nothing like a good scare and a lot of blood to jolt your perspective into the present moment. It is 1 a.m. and we just got home from the emergency animal clinic. Barney, our 18-year-old African grey parrot, took a nose dive off the top of his cage. I was going over to pick him up, and he scuttled away from me, startled, and fell straight to the ground. Periodically he does fall – usually, he just gets ruffled feathers. I scooped him up and carried him over to his other perch, then went back into the kitchen, where Sabrina and I were heating up leftovers for a late dinner. I happened to glance down at my hand, and saw blood. At first, I thought it was from me – then I said out loud, “Barney!” and we both raced into the other room. The fall had cracked the tip of his beak. He was bleeding profusely. Sabrina held him in her lap, applying pressure with a towel, while he screamed wildly. I ran for the phone, and started calling clinics. First I called Pet Care, the 24-hour clinic in Santa Rosa. They did not have a bird vet on duty. So I called Memorial Beach in Healdsburg (Barney’s regular vet) and another vet in Rohnert Park. At both numbers, I got answering machines referring me to Pet Care. When I called the emergency clinic in Rohnert Park, they said they had no one available, and gave me a number for a clinic in Marin, nearly a two hour drive from here. I tried to find personal phone numbers of vets, but no luck. I called a couple of friends, to see if they had emergency vet numbers. No. So I called Pet Care again, near panic. Sabrina’s hands were covered in blood, and the towel was getting saturated. Losing too much blood is a real fear with birds. I convinced Pet Care to see him, regardless. Right after that phone call, the bleeding stopped. But we weren’t sure how long that would last. We took care of all the other animals, grabbed a carrier and an extra towel, and headed out the door. At the clinic, the vet on duty had called the animal specialty unit in Davis to get advice. He examined Barney, gave him a shot with an analgesic, and prescribed anti-inflammatory medicine, telling us to check in with our regular vet tomorrow to see what else might need to be done. We drove the long hour home, momentarily relieved and breathing easier. And then he started bleeding, again. I got on the phone, talked once more to the vet tech. She said there was nothing she could do – we just needed to keep applying pressure, and keep him as calm as possible. Fortunately, it was less severe this second time, and the blood flow stopped fairly quickly. He is now in his carrier for the night, covered, calm, and for the time being, safe. In the six years that Sabrina and I have been together, we have been to the emergency room once for me, twice for her, three times for Barney, once for Dozer the cat (rattlesnake bite), and once for another cat, Ziggy, who did not survive a dog attack. Nothing brings home what is important in life more than those tense car trips to the ER, with someone you love in pain at your side. It’s not a pleasant way to wake up – but it works. I played violin when I was young, through college. And I also play the piano. I began taking lessons again in January after a long hiatus. I absolutely love playing – I can get so lost in it, that mesmerizing combination of logic and rhythm and melody and ethereal magic. Of course, my own playing is frustrating nearly as often as it is satisfying, because my fingers won’t quite cooperate with the perfect tune in my head. But oh, those moments when it works: it makes it all worthwhile. I heard Jeffrey Kahane play Rachmaninoff’s Piano Concerto No. 3 with the Santa Rosa Symphony recently. I had never heard him play before, and I had never heard the “Rach 3” – I overheard another patron referring to the concerto this way, and sure enough, upon doing research, found that this is what the “in the know” people say! It was incredible, listening to him play. His touch was so masterful, the range of dynamics so broad, his ability to both sing out the melody line and subdue the accompanying hand, switching back and forth – I was intensely envious. He made it all look so easy! I am currently working on a Chopin waltz, and although I am beginning to master the notes, the mechanics, I have not even begun to be able to interpret it, to explore it, through the full range of its possibilities. After that night, I wanted to get a copy of the concerto. I often play classical music in the car during my commute to Calistoga. I went to The Last Record Store in Santa Rosa, the best place around to actually talk to a live person who knows something about music. Searching through the database, we discovered that there was a rendition of the Rach 3 by Martha Argerich, an Argentinian who happens to be one of my favorite pianists – I fell in love with her renditions of Chopin, and have a couple of those CDs. My infatuation with Chopin is largely due to her. My last recital piece was one of Chopin’s Preludes. During the weeks before my recital, I played her CD with the Preludes over and over and over again, trying to soak in her style and translate it into something with my own hands. So tonight, driving home, I was listening to Martha Argerich play the Rach 3 for the first time. It opens with a simple, lyric, heartbreakingly sad melody, which recurs periodically throughout the piece. But from there, it goes everywhere – driving, mad, rushing notes, waterfalls of scattering rain, swelling crescendoes and decrescendoes, moving in and out of the rest of the orchestral sound. It is stunningly beautiful. No matter how long I practice, I will never be able to play like that. But because I play, in my own imperfect, beginner way, I am always expanding my ability to hear the music of others. That is the gift of practice: opening myself up to beauty. That’s good enough.